Outsource2india provides reliable and consistent CNC programming services for small to medium and large companies. Taking advantage of an efficient team of programmers and analysts, Outsource2india cuts down turnaround time to 40%. We work on a variety of machines (from a wide range of industries including automobile, heavy engineering, aerospace, etc.) to provide seamless services that provide clients with reduced idle time. Besides, this also prevents clients from investing in expensive CNC resources. As one of the better-known names in the computer numerical control service industry, we have executed complex programming requirements with an impressive list of satisfied clients. Outsource2india is geared up to meet changing technologies and tools that help you stay ahead in your business. 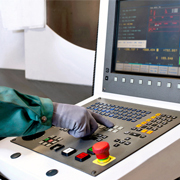 CNC Programming - Outsource2india provides reliable CNC programming to match client requirements. With details such as drawings of the part in readable format, machine specific details, blank material and size, available tools list, and sample program, we can provide CNC lathe, horizontal machining center, vertical machining center, VTLs, 4&5 axis machines, detailed cycle-time sheet, tools list, and operation-wise machining details. Skill Development - We design and implement skill enhancement or training programs to increase your productivity by maximizing output from floor team. With inputs like workers skill level, number of attendees and batches, information on facilities, e.g., classroom, projectors, etc., we can help you develop training on information on CNC machines, details on operation settings, training on manual programming and CAM software training. Cycle Time Reduction - We help you with improved productivity and higher profitability by reducing CNC programming time, cycle time, setup time, and part rejections as well. Outsource2india helps you with customized post processors to ensure cycle time accuracy, handholding of service personnel for smooth functioning and undisrupted technical support for zero lag time. Direct Numerical Control (DNC) - Our CNC programmers efficiently transfer codes from the PC to CNC machines without reducing production time. We used NCnet to deal with part rejection issues due to outdated programs or due to unauthorized access or outdated programs. Productivity Monitoring - Outsourcing CNC services helps you increase profitability with wireless product monitoring and reporting. Be it predictive maintenance or OEE calculations, our team of programmers help you achieve maximum productivity with minimum investment. What are the Benefits of Choosing O2I for CNC Services? Outsource2india provides CNC services for multi-tasking machines to aid industries involved in heavy engineering. We help clients enhance productivity, reduce lag time and increase profitability by providing experienced CNC programmers to fit global time zones. Therefore, if you are looking out for reliable CNC services in India, then you are at the right place. To learn how you can benefit from Outsource2india taking up your CNC programming related projects, contact us today.